Choosing the shape of the diamond is a personal aspect, one which can turn a diamond into your diamond. Just as your best friend may not like your choice in clothing, the shape of a diamond can be as personal and unique to your desires as you want it to be. Before we get on to the fun stuff about the types of diamond shapes, we just wanted to clear up a little myth about diamond shapes and cuts. Firstly the cut is a completely different aspect to the shape, although a lot of jewelers and professionals do use the term interchangeably. As a consumer it can be very easy to get confused if you are not armed with the correct information. 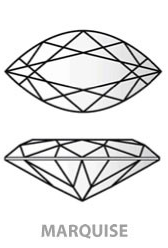 The shape is the outline of the diamond, whereas the cut refers to how a diamond has had its facets and proportions shaped to reflect light and create that wonderful brilliance and fire. 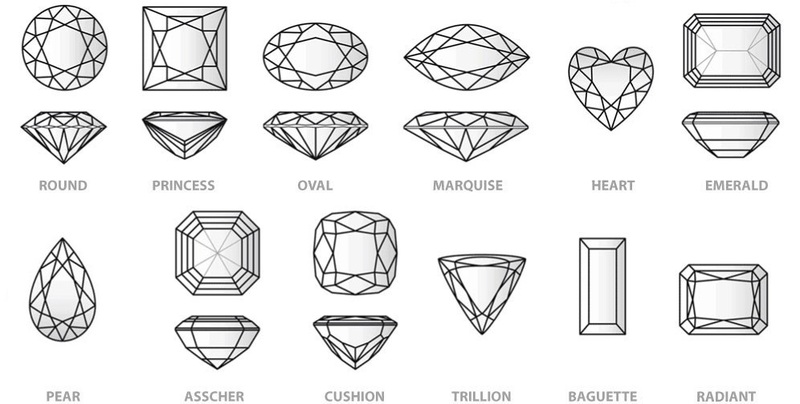 We have a full section dedicated to the diamond cut, so please do take a moment to read it before making a purchase. It is worth noting that as it stands the AGSL is currently the only diamond certification laboratory who can assign a diamond cut grade for loose diamonds that are Princess cuts, Emerald cuts, Oval cuts, and Cushion cuts. Now that we have cleared up the difference between cut and shape, we will show you 12 of the most popular diamond shapes available. The rest is up to you to choose the shape that reflects your unique personality perfectly. The Round Brilliant cut still accounts for over 70% of all diamond sales in the market. It cut and polished to achieve the Hearts and Arrows cut to create an unrivalled fire and brilliance. It is a traditional shape that offers additional flexibility to the wearer by fitting into a variety of settings as well as being very flattering to all hand and finger shapes. The second most popular diamond shape, the Princess can often be bought at a lower price due to the way a diamond has been cut from its rough state, giving much less wastage than some of the other fancy cut diamonds. It offers a slightly more contemporary look to the Round Brilliant but still looks great in a traditional setting, making it ideal for the wearer who wants a classical style with a modern twist. If you’re looking for an exceptionally high quality round cut or princess cut diamond, take a look at the A CUT ABOVE Diamonds line from Whiteflash. If you’re looking for Fancy Cut Diamonds or if price is your main priority take a look at James Allen or Blue Nile. The Oval cut follows similar cutting principals as the Round Brilliant due the nature of its shape and can be a really beautiful shape for the wearer who wants a classic twist on tradition. Although Oval cut diamonds only account for around 2% of the diamond market this style is becoming increasingly popular. The Cushion or Pillow cut is often thought of as a new fancy cut, fashioned by recent celebrities such as Jennifer Garner and Ivanka Trump but the shape has actually been around for over 100 years. The Cushion cut can offer many benefits over some of the other shapes as it can bring a bit more flexibility to the desired style by being more round at the corners or squared off to create a unique shape for the wearer. The Marquise cut can suit smaller hands by naturally drawing the eye along the length of the diamond creating the illusion of elongated fingers. It is the perfect cut for maximizing carat weight by emphasizing the size of the diamond, giving a good spread on the hand, even though it may have a smaller carat weight than it looks. Emerald cuts are easily recognized by their unique elongated shape with bevelled edges. With a large table (the top) and stepped pavilions (sides) an Emerald cut can offer an individual and elegant look. Rather than the fire and sparkle given off by a round brilliant cut diamond, the Emerald has a more refined and demure look to it, bouncing light off the dark underside planes to create a ‘hall of mirrors’ play on the light. Extra care must be taken when choosing an Emerald shape as with it having a large, open table, inclusions may be much more noticeable than in other shapes, as will any variations in color, so be sure to choose the best quality diamond you can afford if choosing this shape. 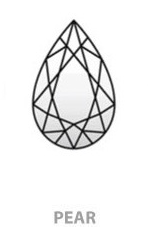 The Pear cut offers a modified version of the Round Brilliant and Marquise cut diamonds. The Pear should be cut to give maximum fire and brilliance, so symmetry in the shape is very important. 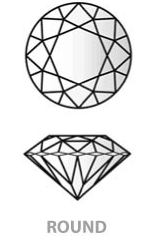 Different length x width ratios can be chosen from 1.4 – 1.6 to create the desired shape but ensure that every aspect of the shape is uniform before purchasing a Pear cut diamond. The Pear, like the Marquise can be an excellent choice for elongating fingers and looks very elegant when set upon a ring. The Asscher cut was first made famous in the early 1900’s by the Asscher brothers. The shape reached its peak in the 1920’s during the art deco era but it is only recently that it has started to make a comeback. Similar in appearance to the Emerald cut, the Asscher offers a more square design which is perfect for superb sparkle without the larger table on show as found in the Emerald cut. Looking down an Asscher from the table, it should appear to have symmetrical and uniform square patterning beneath it, creating a stepped look which will catch the light and give brilliance and fire. Radiant cut diamonds are a perfect hybrid between the Round Brilliant cut and the Princess cut. The shape of this diamond allows a faceted pattern to be created to enable superb scintillation and brilliance to the diamond. First made popular in the 1980’s the Radiant cut offers additional flexibility to the wearer as its shape makes it ideal for settings that are a little more modern than the traditional solitaire, enabling it to look stunning as part of a pave design. A heart has been the symbol of love since time began and so having a diamond in this shape is the perfect way to capture the 2 main elements of adoration and love in one moment. The Heart cut can suit traditionalists who desire a single solitaire stone setting with a unique twist away from the Round Brilliant cut. Symmetry in this shape is extremely important and it is paramount that when choosing this shape that one side mirrors the other. The ideal length to width ratio of Heart diamonds is 1.0, however this can range from 0.8 – 1.10 to create a longer or more square looking diamond. The curves of each side must be smooth, finishing at a rounded tip which lines up centrally with the center cleft. The Trilliant Cut is often mistakenly called the Trillion cut or Trillion cut, neither are correct and are either mistaken names or branded trademarks from diamond companies. The Trilliant is becoming increasingly popular, although it was first brought to the diamond market during the 1960’s in an attempt to get the maximum amount of carat weight from a rough diamond. The shape itself refers to any diamond that is triangular in shape across each plane and typically consists of between 31 – 50 planes, giving it a unique and individual look. The Baguette Cut is a shape which goes in and out of fashion. It was first introduced into the mainstream diamond market during the first few decades of the twentieth century when it was used in costume jewelry. Similar in appearance to the Emerald cut, the Baguette shape has pointed corners rather than curved. As with the Emerald, care must be taken to ensure that a Baguette cut is eye clean on viewing as minute inclusions will show up easily due to the large table. Now that you have a little more knowledge about the most popular shapes available, the choice is up to you to find that perfect shape that matches your personality, budget and finger type. Just don’t forget this: Cut is King, Shape is Personal. 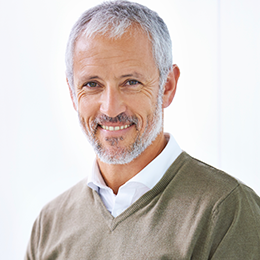 We have covered the basics here regarding the positives and negatives of each shape but we highly recommend that you choose a reputable diamond company such as James Allen, Blue Nile or Whiteflash who will ensure that the relevant certification is available before you purchase that perfect diamond.